After two hugely successful first installments, this big budget pirate spectacular trilogy (based on the Disneyland ride) is coming to an end (so it seems...). 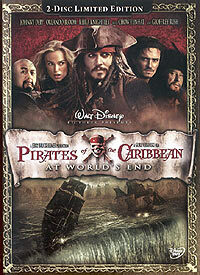 At the end of the second chapter Depp’s character Captain Jack Sparrow was swallowed by the Kraken sea monster. Will and Elisabeth have to make an alliance with old enemies, sail off the end of the earth to save Jack and make a final stand against their foes, the undead Davey Jones and (the equally slimy) Lord Beckett. Beckett controls Davey Jone’s heart (locked in a trunk, and with it want to rule the seas. The 9 pirate lords are summoned to raise the trapped Calypso, Davey Jones’ lover, as a last ditch effort. With huge special effects and some pretty good writing, this romantic tale of pirates on the high seas is all-round entertainment. Extra disc contains many featurettes and looks at various aspects of the production, from special FX, to the music (and a lot in between).